Discover the beauty and wonder of science! Want to know if that cake is in the right temperature? 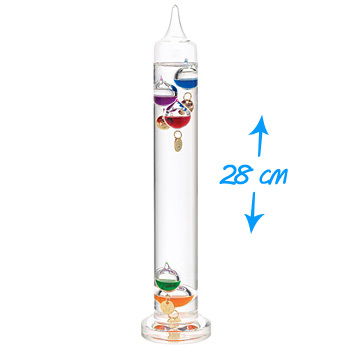 Pick Galileo Thermometer and rediscover the wonders of old-age science. Aesthetically designed to read temperature it is nothing like a regular thermometer. Based on Physicist Galileo Galilei’s theory that density of liquids changes according to temperature, this thermometer takes us back in time where taking a reading anywhere and anytime did not require a high-tech equipment. Such a cute gift for teachers and science lovers, it is a fun way to demonstrate the above said theory to kids as they wonder in awe at the beautiful bulbs that rise and fall with varying temperature. The silver tag on the lowest of the upper floating bulbs is the reading that you are looking for. Though not accurate it is sure a practical and colourful way of teaching kids. It is a simple and stylish reminder in hand-blown glass, elegant in design reflecting a 400 year old technology. Coming with a full set of instructions, it is an innovative gift for growing kids as well. Product dimensions: 28 (H) x 3.6 (W) x 3.6 (D) cm / 11.0 (H) x 1.4 (W) x 1.4 (D) inches.